I am pleased to present the Annual Report for Mourne Heritage Trust for 2012/13. This business year has seen the Trust continue to survive and thrive in difficult circumstances, both in terms of ever increasing pressure on the special qualities of the Mourne AONB and in a challenging economic and public funding context. With this in mind, I was particularly pleased to see the Trust not only act as a guardian of our special landscape and heritage but, in so doing, continue to be a significant source of employment creation in the South Down area. Indeed in the closing months of the year the Trust’s payroll was at its highest ever. Full and part time posts have been created by new work streams built on the solid base provided by the Trust’s core team and, specifically, the project funding that their hard work has levered. Trust activities and funding drawn also supported significant private sector employment in the local area. For example, through substantial contracts, the path upgrade project in the high Mournes has employed skilled local people in stone working and digger driving, while the Mourne Coastal Route developments have provided jobs in construction and landscaping. There have also been spin offs from supplying these projects, not least for my fellow Mourne farmers from whom we have bought sheep’s fleeces for use in path foundations. While, like many organisations in recent times, we have been challenged by contraction in our core resource base, I am heartened that - working with funding partners - we are developing mechanisms that enhance the efficiency with which resources are used. This year Northern Ireland Environment Agency, our largest funder, agreed to work towards a ‘Key Partner Agreement’ with MHT and committed in principle to core funding for the next five years. I would like to thank the Agency and our other core funders, namely the Councils of Banbridge, Down and Newry & Mourne along with Northern Ireland Tourist Board, for their on-going support. In this report you will find details of our progress on implementing our guiding strategy, the Mourne AONB Management Plan, along with details of the various projects that deliver upon its objectives. For example, the Active Lifestyles programme has continued to go from strength to strength, stimulating a huge volunteer effort to complement the work of our countryside staff and to assist in erosion, litter and wildfire control. The year past was a milestone one for sustainable tourism in the Mournes, with the completion of the various elements of the Mournes Signature Project, in conjunction with NITB, Councils, Loughs Agency and other partners. I look forward to the Trust continuing to play a key role as the focus moves to developing ‘Destination Mourne’ and to leveraging the benefits of the significant capital investment that the Signature Project has brought. 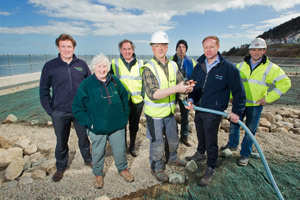 Just as one major initiative came to a close we saw the Mourne Mountains Landscape Partnership begin in earnest, with approval by the Heritage Lottery Fund of over £1.5m funding as the base of a £3m plus programme to ‘re-connect’ people with the special landscape qualities of the high Mournes. 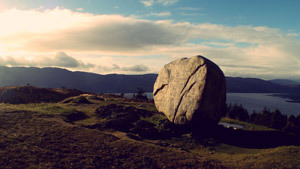 The Trust has also had a key role in developing the Mourne Cooley Gullion Geo-tourism programme, submitting the original application for Interreg IVA funds and working with partners to achieve ‘lift off’ for this €1.64m project in the last year. Another piece of good news is the award to Dr Arthur Mitchell, my predecessor as Chairman of MHT and current Vice Chairman, of the Europarc Alfred Toepfer Medal for 2012. This prestigious European honour is in recognition of Arthur’s outstanding contribution to nature conservation and sustainable local development, much of it through Mourne Heritage Trust. It has been my good fortune to have been able to build on Arthur’s work in helping to establish and develop Mourne Heritage Trust and I continue to benefit from his expertise and enthusiasm. However, as Arthur himself was the first to point out, the credit for the recognition he received is shared with the Board members, staff, funders, partners and supporters of MHT and I look forward to continuing to work with you all in the year ahead in Caring for Mourne. The Mourne Heritage Trust was established in 1997 to meet an identified need for locally based, strategic management of the Mourne AONB, which spans 570 square kilometres in the south east of Northern Ireland and includes the Mourne mountains, a beautiful coastline, the ancient uplands of Slieve Croob and the foothills and drumlin country in between. 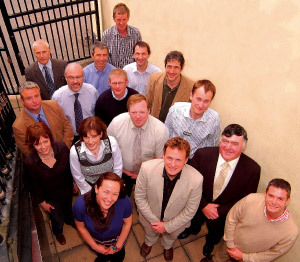 The model of a Trust-based partnership was agreed by Environment and Heritage Service (now Northern Ireland Environment Agency) and Northern Ireland Tourist Board, in conjunction with the Department of Agriculture and Rural Development, and the three local authorities of Banbridge, Down and Newry & Mourne respectively. The Board of Trustees represents a partnership of interests which includes local elected representatives, landowners, farming, community and other stakeholders. 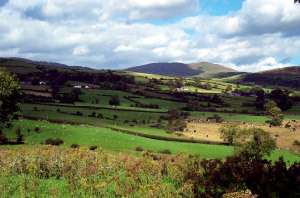 The Board gives a strategic lead to the management of the AONB. The Board met collectively on seven occasions throughout the year. In addition a number of members contributed significantly through the Executive Committee, Natural Heritage Sub Group and Tourism Forum among other mechanisms. There were two changes to Board membership in the course of the year. Mr Sean Rogers, having stepped down as a Councillor to take up a Northern Ireland Assembly seat, was replaced Mr Connaire McGreevy as a Newry & Mourne District Council representative in June 2012. 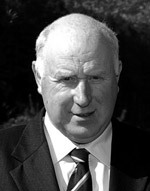 In September 2012 Mr Jim Saunders resigned his position, having been a Board member since the establishment of the Trust. We would like to take this opportunity to recognise the valued contribution Jim made, bringing both his environmental expertise and significant educational experience in addition to his obvious commitment. The present Board membership is listed below. The Mourne Heritage Trust held its fifteenth Annual General Meeting on Wednesday 3rd October 2012 at Warrenpoint Town Hall, and was opened by Mayor of Newry and Mourne, Cllr John McArdle. Guest Speaker, Dr Ian Meighan, gave an entertaining overview of the complex geological processes that gave us the much loved Mourne landscape. Having previously worked for the Trust as Sustainable Tourism/ Signature Project Manager, Ms Camilla Fitzpatrick was appointed Mourne Mountains Landscape Partnership Programme Manager. The team for this project was completed by the appointments of, respectively, Ms Emma Cunningham (previously Volunteer Co-ordinator) as Projects Manager, Mrs Alwynne Shannon as Outreach Officer and Mrs Amanda McDonald as Administrative Officer. 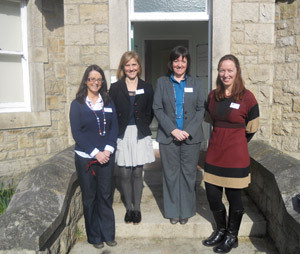 Ms Cathryn Cochrane replaced Ms Cunningham as Volunteer Co-ordinator. At intervals through the year the Trust employed Mr Philip Savage and Mr Martin Sharvin as temporary upland path repair officers. 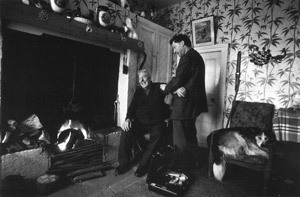 Mr Savage also acted as seasonal temporary Countryside Officer. The work of Mourne Heritage Trust again found recognition on a European stage this year through an honour bestowed upon its first Chairman. At a Gala ceremony in Genk (Belgium) in October 2012, the EUROPARC Federation in cooperation with the Alfred Toepfer Foundation F.V.S. 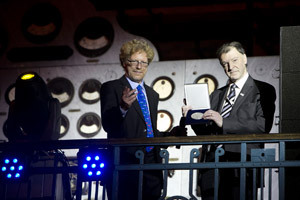 awarded the Alfred Toepfer Medal to Dr Arthur Mitchell. This medal, named after the founder of the EUROPARC Federation, is awarded annually in recognition of a particular individual who has made a significant contribution to nature conservation in Europe and is presented at the annual EUROPARC conference. Presenting the award, the President of Europarc, Mr Thomas Hansson, said: ‘At the heart of Dr. Mitchell´s mission stands local ownership. Peoples´ participation is the core of the community networks he initiated to protect and enhance natural landscapes, with income generating opportunities through sustainable tourism and other activities’. At the ceremony, Mr Tony Gates, formerly of Mourne Heritage Trust and now CEO of Northumberland National Park, spoke warmly of Dr. Mitchell´s contribution and deep personal commitment to working for the well-being of Mourne and its communities. All associated with Mourne Heritage Trust can endorse these sentiments and we wish to take this opportunity to record our congratulations to Dr Mitchell. The Management Plan was developed in 2010 through both review of relevant research to provide a sound evidence base and extensive consultation with local people and other stakeholders to provide further insights and build consensus. This was particularly important as the plan is relevant to anyone whose activity or decisions affect the Mourne AONB and not just a plan for Mourne Heritage Trust. While it is a non-statutory document, the successful implementation of the Management Plan draws on the commitment of various agencies and local stakeholders to pursue these principles in line with their abilities, priorities and resources. For each theme the plan articulates in detail what is special in the area relating to that particular aspect of landscape – natural and/or human. It also sets out what broad approaches the various interested parties see as important to maintaining and enhancing those qualities. The Action Plan goes on to set out specific timetabled actions to give effect to these approaches. 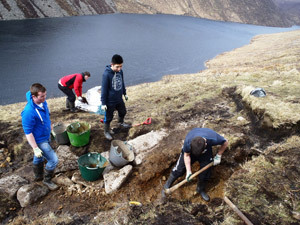 In the Mourne AONB, Northern Ireland Environment Agency, in association with partner agencies, supports Mourne Heritage Trust as the mechanism for co-ordination of implementation of the actions identified. In conjunction with a representative Steering Group, the Trust drives and monitors progress. The figures outlined above show a lower proportion of actions moving from the Orange to Green category than in previous years, but that is perhaps to be expected as we move through the middle phase of the plan period. Equally the figures indicate that early progress has been consolidated and increased, with a notable shift of projects from the red category. That there is now only a single digit percentage of actions in that category is encouraging at the end of year three of the five year plan and it is also worth noting that initial progress has been made on some of those actions still categorised red. Overall, we feel this outturn indicates that much of the groundwork has been laid to move towards a significant degree of completion by the end of 2015. Much of this will be through projects like the Mourne Mountains Landscape Partnership, Mourne Cooley Gullion Geotourism, Mourne Wildfire Pilot and Destination Mourne Mountains, into which much development work has been invested in the last three years and which are now moving into the optimum delivery phase. Finally, it should also be noted that some additional actions not identified in the original management plan but complementary to its objectives have been developed through funding and research opportunities that have subsequently come to the fore. In the final analysis of achievement against the action plan these will be balanced against areas where progress may have been less than originally aimed for. Of course as well as coordinating and monitoring implementation of the Management Plan, the Trust’s role is also to provide direct landscape management services and to develop and deliver relevant projects. In the remainder of this annual report we focus on the subset of management plan activities undertaken directly and/or led by Mourne Heritage Trust. Enhancement of priority habitats and species, in line with the Mourne Biodiversity Action Plan, is perennially a key focus for the Trust. In the year past we have given particular attention to the upland heath which gives the Eastern Mournes its European Special Area of Conservation (SAC) designation. Activity has included liaising with Northern Ireland Water, Northern Ireland Environment Agency and the Department of Agriculture and Rural Development on grazing for optimum heathland condition. These and other partners supported our co-ordination of a consultancy study by AECOM on heathland management and follow up work with all partners has identified agreed priorities. Alongside the strategic research and planning, practical heathland restoration works were carried out alongside the Silent Valley Nature Trail. Combined with the development of a methodology for collecting heather seed and the establishment and on-going monitoring of sheep exclusion pens, this work has added to a bank of knowledge that will support a large scale heathland regeneration pilot scheme under the Mourne Mountains Landscape Partnership. We were pleased to receive established juniper plants from Cheviot Tree Nursery, Berwick upon Tweed, which had been grown from cuttings taken in the Annalong Valley. These are being acclimatised in the Trust’s tree nursery and, along with additional juniper grown there, will be planted in the high Mournes in 2013/14. This takes careful planning, not least to ensure good bio-security and accordingly we have liaised with Plantlife, NI Environment Agency and others to develop replanting and monitoring approaches. Another Special Area of Conservation, Rostrevor’s ancient oak wood, provides some of the seed for the Trees for Mourne project, which continued to attract landowners. A further 5 acres were planted with native trees, bringing the total of conservation woodland now planted under the project to over 40 acres. In terms of other key species our red squirrel project has remained a priority. The Area Ranger and a key volunteer undertook a NI Squirrel Forum study trip to the Lake District and attended a grey squirrel control training course in Scotland. Funding was also secured to acquire a quad bike and trailer to support the significant volunteer activity in this project. A key aspect is removing the Grey squirrel from strategic locations, a different form of invasive species clearance to addressing invasive plants like rhododendron and cotoneaster, which our Countryside Team continue to tackle. It was a considerable relief that 2012/2013 did not see a repeat of the extensive wildfires that in 2011 severely damaged large tracts of the Mourne AONB landscape. However, despite more favourable climatic conditions, wildfires still occurred and we have not been complacent about this major threat. Close monitoring of the recovery of lands affected by fires has contributed to our knowledge bank in relation to how fire behaves and impacts. To learn more at first hand, the Trust’s Countryside Services Manager travelled to a European wildfire training course in Catalonia, Spain and saw the very latest in wildfire control techniques in action. Alongside this the Trust co-ordinated work by expert consultants, Wildfire Advisory Services, which developed an innovative plan for limiting wildfires in the Eastern Mournes. The approach utilises computerised wildfire modelling systems. These draw on wildfire history, weather data and scientific research on heathland fires to establish a way of predicting how wildfire would spread through the landscape given typical climatic scenarios. Using this knowledge we can begin to plan measures to control spread. With this in mind we focussed on a report for stakeholders to inform best practice across Northern Ireland, and on prioritising the report’s recommendations for implementation locally. Actions will include establishing a Mourne Wildfire Group, involving key partners like NIEA, NI Water and Fire & Rescue Services, and carrying out the prescribed management of specified critical control points in the landscape. A very welcome addition to our volunteering effort this year was the establishment of a Mourne Nature Watch conservation group. The group established a Facebook page and an event programme, which commenced in early 2013 with a coastal walk and talk. The focus, as the name suggests, will be on encouraging participation in habitat and species monitoring. Our Mourne Natural Heritage Awards again recognised key volunteers. Peter McGowan, who leads the Mourne upland path volunteer team and carries out vegetation and wildfire surveys, won the individual award. The Egan family won the group award for their continued efforts in lifting bag upon bag of litter from our countryside and coast and for their support and assistance at natural heritage training events and our tree nurseries at Dunnywater and Silent Valley. The success of the Active Lifestyles programme was further highlighted with the granting of a one year funding extension by BIG Lottery. This will take the project into a tenth year, to 2016. 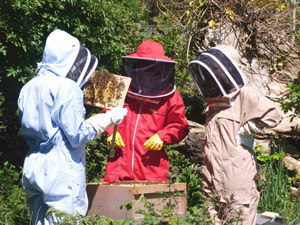 Also included was a £10,000 award to investigate the on-going sustainability of the activities beyond that date. The programme continues to attract participants from socially excluded sectors including new black and minority ethnic groups through Barnardos and Volunteer Now. It has also allowed our volunteer path team’s efforts to be augmented by corporate groups like British Telecom, Department of Agriculture and Rural Development and Northern Ireland Water. Our litter control effort was also significantly enhanced by volunteers notably on the Kilkeel coast, at Mill Bay and around Carricklittle track, a key entry point to the Mournes. The Youth Ranger programme was streamlined this year to enable us to better develop individual learning and skills. 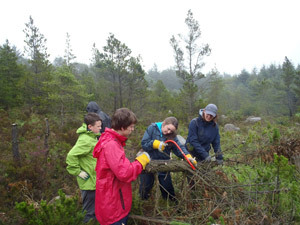 10 young people took part and were trained in erosion control/path repair, wildfire monitoring and invasive species management to protect native heathland. Further development of Dunnywater and Silent Valley volunteer sites with the construction of new polytunnels, greenhouses and raised beds and the refurbishment of existing sheds at Dunnywater. The second phase of our major upland path programme swung into action this year, focussing on approximately 3km of eroded paths at Binnian North tor to the ‘Back Castles’, Binnian Summit tor to the Carricklittle track via the Mourne Wall and the Brandy Pad to the ‘saddle’ of Donard. After the procurement of a project consultant and a contractor, works commenced in November 2012. Battling through the impact of severe snow and frosts, 1700m of path in total had been completed by the contractor by the year end, while significant associated landscaping works were undertaken by our Countryside Team and volunteers. Notwithstanding the determination of all involved, the challenging weather conditions required the negotiation of timetable extensions which will now see works complete in Autumn 2013. Positive feedback on techniques used and outcomes to date has demonstrated that lessons have been learned from earlier erosion control works. In particular, the importance of designing paths that maintain the challenge of being in the remote outdoors has been paramount in our approach along with the simultaneous landscaping of eroded areas adjacent to repaired paths. The two phases of our erosion control works and concurrent key access corridor improvements have seen upwards of £700,000 from various sources invested in the path network in the Mourne AONB since 2010. Accordingly monitoring and aftercare of the works undertaken has been a priority in 2012/13. The early summer of 2012 saw some of the heaviest downpours ever experienced in this area, including 70mm and 80mm in a day on a number of occasions in the High Mournes (20mm is the amount associated with an ‘average’ rainy day). As a result, an area of the Glen River Track that had been repaired and stabilised in early 2012 required significant further remedial work due to ‘wash out’. 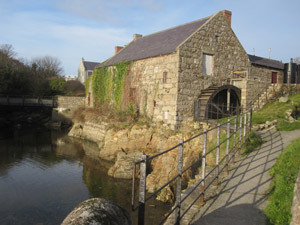 While this damage to recently completed works was immediately obvious, care has also been taken to devise a formal path monitoring programme for the sections repaired in recent years as well as more specific visitor management interventions, like the footbridge installed at the Glenfofanny River in the Bloody Bridge access corridor. The monitoring programme is designed to provide both early warning of any on-going issues and to monitor the performance of the techniques and approaches used. As well as ‘eyes and ears’, the approach utilises technology like fixed point photography with remote cameras and video, using Global Positioning System (GPS) technology to record findings on Geographical Information Systems (GIS). Among other things, our monitoring enabled the planning of a reseeding programme on eroded areas adjacent to the repaired tracks. We have also initiated rain gauge monitoring in specific areas to ensure we learn about and take account of this significant pressure. And having consolidated data from our electronic visitor monitoring network, our Rangers also piloted and selected new visitor counting kit which will provide us and partners with more robust and regular data on usage levels and patterns. To complement assessments of our own direct experience, we also devoted time this year to ensuring we are up to speed with best practice in path repair in other areas. Study visits to the Lake District and the Cairngorms provided both new ideas and affirmation that our path works were being carried out to a very high standard relative to other locations. Staff and volunteers gave considerable emphasis to engaging with key stakeholders, not only to build awareness and understanding of the rationale for the various path works but also to obtain perspectives and feedback on the techniques used. This activity combined site visits for user groups like Mountaineering Ireland and the Ulster Federation of Rambling Clubs with more formal networking like a presentation to an Upland Path conference in Wicklow in September 2012 and meetings of the Mourne Outdoor Recreation Forum. Another key element of our engagement activity has been encouraging best practice in the conduct of outdoor recreation events. A presentation at an Outdoor Event Planning workshop in October 2012 set the scene for a more systematic approach to event monitoring, to be implemented in Spring/ Summer 2013. The importance of establishing objective data is central to the way forward. This will include observing the impact of events on sensitive habits, contextualising this with wider on-going path monitoring. This revised process represented one of the first steps in implementing the recommendations of the Mournes and Slieve Croob Strategic Path Review that we completed in 2012. Further discussion of the review’s conclusions and recommendations with stakeholders was undertaken in the context of the findings from the best practice visits outlined above. Underpinning all the activity outlined, has been the consolidation of the Trust’s Ranger Service. 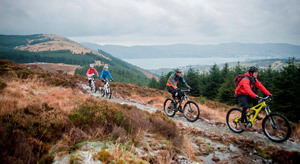 By the year end, we had agreed with District Councils and key stakeholders an approach to augmenting the ranger team to manage new, world-class mountain bike trails at Castlewellan and Rostrevor. In addition, funding was secured to maintain our Access Ranger service through 2013/14, and, in principle, for the 2014 to 2018 period, subject to some match funding being achieved. This service, which began a as pilot project under the Mourne Access Fund, has been vital in assisting our Area Ranger in positively managing increased recreational and social use of the countryside. 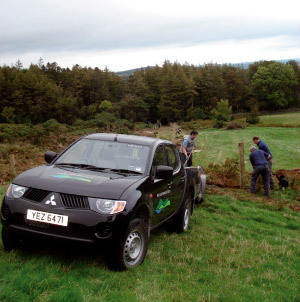 Thus, the strategic upland path projects, managed from specification through to site supervision and quality control by the Area Ranger, have been balanced with the responsiveness of the Access Ranger to landowner and user needs. These included repairing fences and dry stone walls damaged in key access hotspots at Bloody Bridge and Trassey Valley, on-going litter management and agreeing approaches to prevent dog attacks on sheep. The strong relationships built with landowners by the Ranger team were central to negotiating temporary access agreements for upland path works and arranging the supply of suitable materials for path work including local granite and sheep fleeces for use as a membrane over boggy areas. While the Countryside Team - which maintains the extensive visitor infrastructure outlined in our summary highlights and supports the rangers in practical works - remains at two officers, we were able at times in 2012/13 to augment the resource with a temporary path team of two skilled workers. However, in the context of the increasing pressures of recreational use and natural forces, enhancing the capacity of the Trust’s Countryside Team on a more permanent basis, particularly for stich in time path works and practical environmental enhancements, remains a key priority. 2012/13 saw the culmination of the various elements that made up the Mournes Signature Project, initiated by Northern Ireland Tourist Board and co-ordinated by Mourne Heritage Trust. We are therefore taking the opportunity this year to showcase these significant enhancements to the visitor infrastructure of the Mourne AONB and the wider Mourne Mountains destination which we hope will combine to provide a step change in the quality and variety of the visitor experience. What we are sure of is that the elements of the Signature Project have one uniting feature, that is that they provide sustainable access for people to enjoy different aspects of the special qualities of the Mourne AONB: from mountain through countryside & village to coast; from natural heritage through cultural traditions to folklore; and from leisurely through active to adventurous exploration. 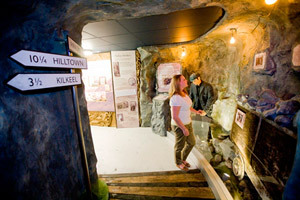 In its ‘Strategic Framework for Action 2004 –2007’, Northern Ireland Tourist Board selected the Mournes among its five key ‘Signature Projects’, identified for their potential to deliver international stand out for Northern Ireland. By the end of this period, Mourne Heritage Trust had completed a comprehensive Sustainable Tourism Action Plan to drive the Signature Project and proceeded to work with partners to develop specific proposals for key projects. This work provided the basis for the Trust to compile a detailed business case for priority capital projects and an associated implementation plan. As a result, Tourism Development Scheme (TDS) funding was ring-fenced by Northern Ireland Tourist Board, allowing the Trust and key partners to set about securing the necessary 50% match funding. This was levered from a variety of sources including the Northern Ireland Rural Development Programme, Northern Ireland Environment Agency, Sport Northern Ireland, Loughs Agency, Arts Council and local authorities. Implementation work proceeded from 2009 on the five strategic projects, which we showcase below. This project had two complementary elements; firstly, to upgrade amenity sites owned by local authorities at key locations along the Mourne Coast and, secondly, to provide ‘White on Brown’ tourism signage of a Coastal Touring Route and associated Scenic Loops. 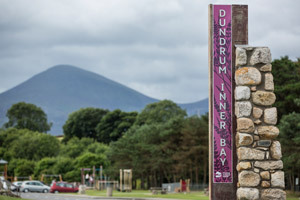 The site upgrades incorporated the development of a Mourne Brand for Coastal Route sites, including feature entrance signs incorporating dry stone walling to create a unique and easily identifiable brand. Complementary high quality site furniture was also selected. A similar distinctive approach to interpretative panels, using the iconic purple of Mourne heather, was also developed and included engaging content on special landscape and heritage qualities. Collectively these sites provide a high quality experience to the visitor, while each also contributes its own unique sense of place. The Mourne Coastal Route has now been signed between the cities of Belfast and Newry, via North Down, the Ards Peninsula, Lecale coast and, of course, the Mournes and includes large gateway signs on the A1/M1 Belfast-Dublin Road south of Newry and the M2 north of Belfast. 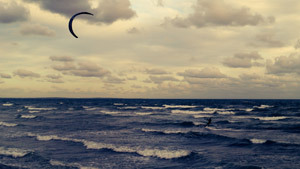 In the Mourne AONB, four Scenic Loops encourage visitors to explore beyond the main spine into the High Mournes, Slieve Croob, Slieve Roosley and the Whitewater Valley respectively. The development of the Route provides the Mourne area with a marketable new product and tangible links to Belfast and the other main population centre and tourism gateway on the island of Ireland, Dublin. The signage was completed within a budget of £300,000 provided by NITB and the participating Councils. The table below sets out the Coastal Route sites upgraded under the Signature Project along with the funding details. 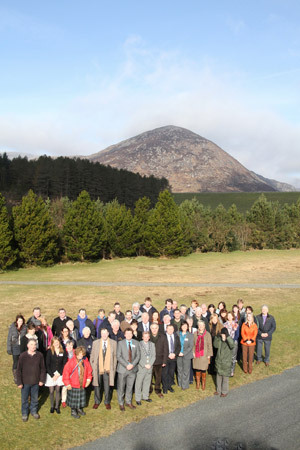 Very much complementary to the Mourne Coastal Route, a comprehensive visitor infrastructure programme took place at the Silent Valley Mountain Park and greatly enhanced visitor servicing at this beautiful and historic site owned by Northern Ireland Water. The improvements saw a further roll out of the signature ‘look and feel’ developed for the coastal route and included improved walks, an adventure play area, an interactive display in the visitor centre, upgraded car parking and amenities and new signage and interpretation. The total cost of the scheme was £364,320 provided by the NITB Tourism Development Scheme and the Southern Organisation for Action in Rural Areas (SOAR). 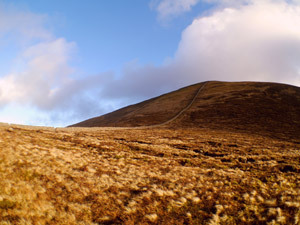 Further developments have since got underway or are planned under the Mourne Mountains Landscape Partnership, including further walking routes, re-instatement of a Watertown House (temporary homes used to house workers in construction of the reservoirs) and a ‘mini-Mourne’ heathland garden. 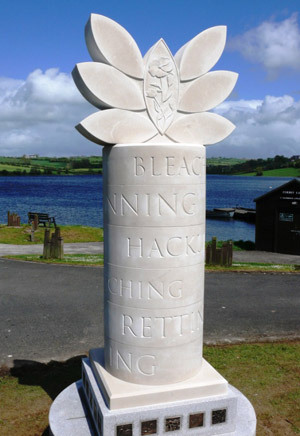 To date, a total of seven pieces of public art (a further phase is planned) have been installed at locations across the AONB. The suite of pieces picks up a variety of themes representative of the special qualities of Mourne, each 'uncovering stories' and appealing to 'emotions, feelings and sensations' to bring the NI tourism brand to life in Mourne. 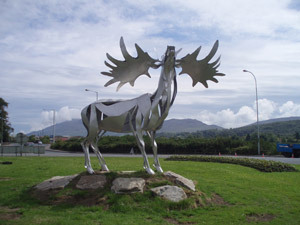 Ancient natural heritage is recalled through an Irish Elk sculpture at Warrenpoint, while the farming that has shaped the Mourne landscape is represented with a man leading his cow to market at Clough and a ‘luck penny’ harking back to the old market days in Rathfriland. The industrial heritage of the linen industry on the River Bann and reservoir building in the High Mournes are invoked at Corbet Lough and Silent Valley respectively. Finally, tradition and folklore are represented in celebrations of the Blaeberry Sunday walk to Slieve Croob in Finnis and, in Dundrum, the legendary magic wave of the adjacent bay. This was all achieved within a modest overall budget of £202,260 which came primarily from the Arts Council for Northern Ireland and NITB with some input from local Councils. 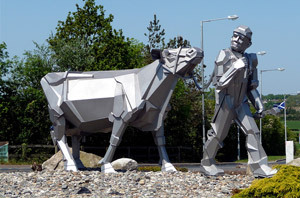 In addition the Trust co-ordinated the commissioning, design and installation of a further piece of sculpture at the new Tollymore National Outdoor Centre near Bryansford. This piece depicts the traditional and ever increasing use of the Mournes for all types of outdoor recreation. Follow on work will focus on capitalising on these pieces in the form of a Public Art Trail as a signature ‘Mourne experience’. 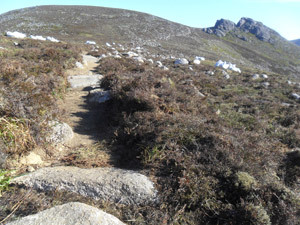 The repair of eroded paths in the high Mournes, was a true example of ‘joined-up government’. 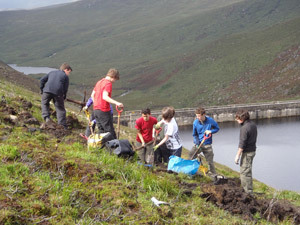 It brought together, in various phases, funding from NITB, Northern Ireland Environment Agency, Sport Northern Ireland and Heritage Lottery Fund through the Mourne Mountains Landscape Partnership to achieve the complementary objectives of protecting the environment, enhancing the visitor experience and making on-going use more sustainable. In all the programme repairs and enhances 4.8km of path at a total cost of approximately £500,000. The ground was prepared, literally and metaphorically, for the Mournes to become a world class mountain biking destination, providing over 75km of mountain bike trails across two centres at Castlewellan Forest Park and Rostrevor Forest. 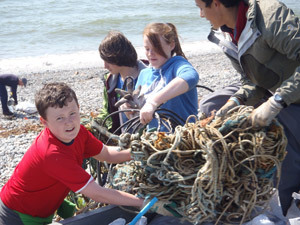 This project was developed by Outdoor Recreation Northern Ireland (formerly the Countryside Access and Activities Network), and driven by them in partnership with Down and Newry and Mourne District Councils. Forest Service provided the land and facilitated the trail construction and operation. The United Kingdom's leading trail designers were employed to design a series of world class trails. 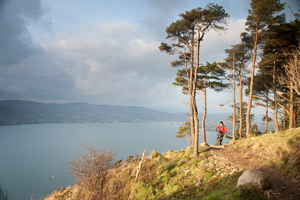 The Rostrevor Mountain Bike Trails, on the shores of Carlingford Lough and set in the Western Mourne Mountains, provide for some of the most exhilarating mountain biking in all of Ireland, with cross-country trails and two purpose-built downhill tracks taking in the summit of Slieve Martin and exciting descents through deep forests and open hillsides. The Castlewellan Mountain Bike Trails cater for all levels of mountain biker on graded ‘green’, ‘blue’, ‘red’ and ‘black’ trails. These meander through the Forest Park and offer views over the countryside of the Mourne foothills to the high peaks of the Eastern Mournes. The funding breakdown for the trails is set out below. We are at an early stage in terms of measuring the impacts of the various elements of the Signature Project in encouraging people to explore the special qualities of the Mourne AONB. However, there have been encouraging early indications of a very positive effect. 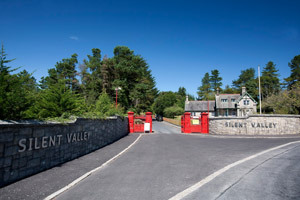 For example, visitor numbers in the Silent Valley were recorded at 48,579 in 2010, the last full year prior to completion of the Signature Project upgrade in 2011. In the following year, 2012, visitor numbers rose to 58,977. This represents an increase of 21% on a ‘before and after’ basis. 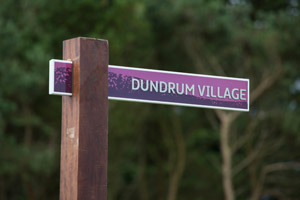 While comparative pre-project figures are not available, the visitor numbers for sites in Dundrum have been impressive. In 2011, through the months of June, July and August, 37,172 car visits were recorded to three sites in the Dundrum/ Newcastle area – namely Dundrum Main Street, Dundrum Inner Bay and the Twelve Arches. Inner Bay, where adventure play facilities, a viewing platform and information on the bird life of the area have been added to what was previously a little used car park, has proven particularly popular with almost 63% of the recorded visits to this site. The Mountain Bike Trails have also been hugely well received. The first monthly user count was completed in June 2013 and showed 4,375 people using the Castlewellan trails and 3,575 using those in Rostrevor – over three times the numbers estimated in the economic appraisal of the project. Progress with the Mourne Mountains Landscape Partnership is covered in detail in the next section of this annual report. While it is not explicitly a tourism project, many of the products of the capital and revenue funding it provides will, as touched on above, help locals and visitors alike to explore, enjoy and connect with some of the special landscape qualities and traditions of the High Mournes. It will thus provide tourism experiences to complement and build on the infrastructure provided by the Mournes Signature Project. The Trust has continued to work closely with local authorities and representatives of tourism businesses to develop a Destination identity and coherent visitor experience for the Mourne area. Priorities in the year past included providing technical input to a revised application for a Green Tourism Accreditation scheme, submitted in conjunction with Down DC to the Department of Enterprise Trade and Investment for consideration of funding. The Trust also provided specific natural and cultural heritage related input to the development of a suite of new visitor servicing and marketing materials, as well as to a Destination Action Plan. Work commenced by Mourne Heritage Trust in 2008 and later developed in partnership with East Border Region Ltd, Newry & Mourne, Down, and Banbridge District Councils and Louth County Council, finally culminated in 2012 with a Letter of Offer of funding from European Cross border fund, Interreg IVA. The project focusses on the shared geological and related heritage of the wider region represented by the granite uplands of south east Ulster and north County Louth. In the year past work concentrated on recruitment of a staff team of five by the lead partner Newry and Mourne District Council. MHT is represented on the Steering Group for the project and provided technical support and advice throughout as a work plan was put in place, project logo and identifier developed and the scoping of interpretation and access development opportunities carried out. 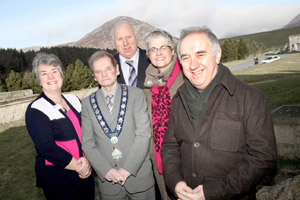 In June 2012 Mourne Heritage Trust received the very welcome news that its proposal for a Mourne Mountains Landscape Partnership had been approved by the Heritage Lottery Fund (HLF) - and with it an award of over £1.5 million in funding from that source to anchor a £3 million plus programme of actions. The award was the culmination of a rigorous assessment of a Landscape Conservation Action Plan submitted by Mourne Heritage Trust in December 2012, that plan itself having been a culmination of two years’ work through a Development Phase. HLF’s Landscape programme helps protect and manage some of the UK’s most outstanding and treasured landscapes. It is for schemes led by partnerships of local, regional and national interests which aim to conserve and enhance areas of distinctive landscape character. The programme aligns significantly with the UK’s commitment to implementation of the European Landscape Convention. 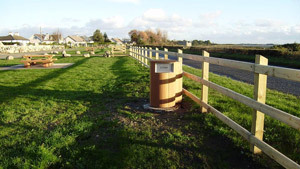 Landscape Partnerships are considered as one part of a wider ambition to improve the landscape’s management and help people connect with it. HLF recognises that landscape conservation is a long-term process and whilst the funding can help support a period of more intense activity, it should also lead to continued activity and a lasting legacy. Minister for the Environment, Alex Attwood (also commenting on the award of a first round ‘pass’ to proceed to Development Phase for our neighbouring AONB, the Ring of Gullion). As many as 30 individual projects make up the Landscape Conservation Action Plan (LCAP) which deals with the upland core of the Mourne AONB. It addresses many of the special features and issues identified in the AONB Management Plan for this particular part of the wider area. In all, the project will cover an area of 223km² (the entire Mourne AONB is 570 km²) around the Mourne Mountains Landscape Character Area and the neighbouring towns and villages. The formulation of the plan was closely guided by the European Landscape Convention’s definition of landscape as: ‘an area as perceived by people, whose character is the result of the action and interaction of natural and/or human factors’. This is considered very apt for the Mourne Mountains – a natural wonder that is, in many respects, reflective of the interaction of man and nature. Local communities will be at the heart of the Landscape Partnership. Skills training and wide ranging participation will allow local knowledge to be shared in a variety of ways. 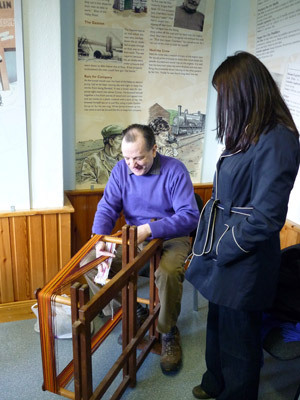 A drive to re-invigorate traditional folklore, handicrafts and skills in communities will ensure the natural, cultural and Industrial heritage of the Mournes is preserved and shared with their visitors. 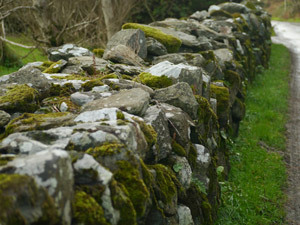 Professional expertise will be brought by key partners such as Northern Ireland Environment Agency (NIEA), National Trust, District Councils and County Down Rural Community Network among others, while trail designers, conservation architects, interpretation and storytelling experts and a range of other professional disciplines also make a valuable contribution. After approval of the LCAP the Trust set to completing some further documentation required for ‘Permission to start’ and this was received in September 2012. The immediate task was to recruit an appropriately skilled and experienced staff team. 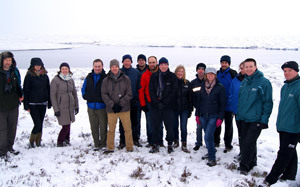 After significant interest and a rigorous recruitment process, the officers took up their posts over the Autumn and Winter of 2012/13, allowing preparations to be made for the programme launch, which took place at the Silent Valley in February 2013. In line with the emphasis of the scheme, attendees were given the opportunity to experience different aspects of the heritage of the area. Some tried their hands at traditional crafts and heather laying, whilst others marvelled at the highly skilled technique of “plug and feathering” which was used by so many of the stone workers to split Mourne Granite. 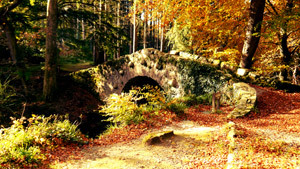 The Project Team’s attention soon turned to implementation of the first phase of priority projects including the restoration of Annalong Cornmill and development of a Mourne Granite Interpretative Centre, the extension of the granite trail at Newcastle, celebration of the historic bridges and follies in Tollymore, creation of healthy heathland pilot sites and new path developments in and around the Silent Valley. 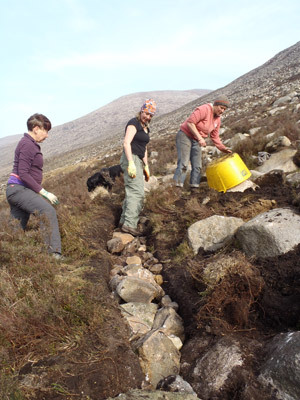 Particular progress was made with erosion control and path repair in the high Mournes with heavily eroded areas being addressed by skilled contractors augmented by volunteers. We look forward in our next annual report to recording the progress with these and the many other initiatives that make up the Landscape Partnership Programme. 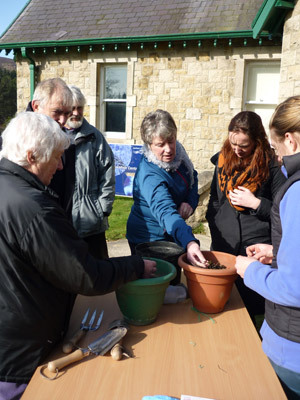 ‘There are three main focus areas to this programme – Granite, Water and Heathland. There are three heritages – the Natural, the Built and the Cultural. And there are three over-arching programmes – Increasing Community Participation, Access and Learning and Training and Skills. Underpinning all of this is sustainability and community involvement.